We are excited to announce Rytmik Studio. New version of Rytmik. We’ve been working on Rytmik Studio for a long time now. Rytmik Studio will come with a fairly large number of samples, but will also allow you to import new ones freely. Your voice or a recording of your guitar can become the basis of the instrument. More than 7,000 songs have already been shared on Rytmik Cloud, and the new version of Rytmik will be backward compatible. We would like to complete new Rytmik sooner. That's why we're launching the crowdfunding campaign now and we're asking for help. If you like Rytmik, then you can support us at INDIEGOGO. Do you want to know about the Rytmik news first? Rytmik Ultimate allows you to share songs with other users using the Rytmik Cloud and to play songs stored in Rytmik Cloud. Users can also exchange their compositions and cooperate on them. Each user has a limited number of slots on Rytmik Cloud. Purchasing the basic version of Rytmik Ultimate gives you 40 slots. You can get more slots in several ways. Getting The Musician (Silver Disc) achievement adds you another 5 slots. Getting The Music Star (Gold Disc) achievement adds you another 5 slots. Getting The Hitmaker (Platinum Disc) achievement adds you another 5 slots. DLC Rytmik Cloud Expansion adds you another 42 slots. DLC Rytmik Cloud Expansion 2 adds you another 210 slots. When you select the PUBLIC CLOUD or USER CLOUD category, Rytmik Ultimate connects to the shared storage called Rytmik Cloud. To use this feature, you need a functional network connection. When storing a song, you can specify its access privileges (UNLOCKED, LOCKED, SEMI-LOCKED or PRIVATE). UNLOCKED means the song will be visible for all and everyone can load and edit it. LOCKED means that the song will be visible for all, but other users can only play it using PREVIEW function and won’t be able to edit it. SEMI-LOCKED means that the song will be visible for all, other users can only play it using PREVIEW function, but clips can be used, modified and redistributed. PRIVATE means that other users can’t see the song. Rytmik Radio is On Air! You can listen Rytmik Radio here or from http://listen.shoutcast.com/rytmikradio/ or https://www.radionomy.com/en/radio/rytmikradio. 146 songs in the playlist (shuffled). This playlist consists of our demo songs and featured songs. Almost 7 hours of music! Rytmik Ultimate Complete is a powerful music station (Groovebox) allowing you not only to play with samples and musical instruments but also to mix them together, shape them and create music clips or whole songs for your Friday night set-list. Robot and Female voices - over 400 words each. Rytmik Ultimate Complete is a powerful pocket music station. This version includes instruments/samples from Rock Expansion and Voice & Acoustics Expansion. Player for songs created by the Rytmik Ultimate community of users and shared through Rytmik Cloud. Now everyone can enjoy a rich collection of thousands songs created in Rytmik Ultimate, including DLC Rock Expansion and Voice & Acoustic Expansion. Filter songs by genre, watch the creations of individual authors, rate songs and choose to listen to the best rated. Listen to the latest news, find your favorites and put them in the playlist. You can share your favorite song over Facebook and Twitter. Shhh - Rytmik is on air! The upcoming Voice & Acoustic Expansion DLC for Rytmik Ultimate is focusing on recorded sounds such as acoustic instruments and voices. Do you want to participate and hear your samples in Rytmik Ultimate? We offer you a unique opportunity to add your sample(s) to this upcoming DLC. Record an acoustic instrument or a voice or any other interesting/unique sound. It must be recorded by yourself (sounds from any other sample banks are not allowed). Then send it to samples@rytmikultimate.com. You can send up to 1 MB, for bigger files please send us a download link. If we find your recording interesting and useful, we will add it to the library. You will get the Voice & Acoustic Expansion DLC for free as a reward. [ADDED] Audio Limiter to the master output and master output section was reworked to reduce unwanted distortion and too loud volume levels. Master limiter can be switched off in Settings menu. Five demo songs made using DLC Rock Edition. Steam: 15% off for a limited time! Rock Expansion allows rock & metal fans to create their favourite music in Rytmik Ultimate. If you felt the original sound set was lacking something that would allow you to make a truly rich and all-embracing rock tune, now is your time. Choose guitars, drums and keys from the library of 230 new sound samples to create a genuine rock atmosphere! Added song name to Song Delete dialog. In clip edit mode instrument Parameter B,C,D values are shown for selected note even when Play is not engaged. In song mode right mouse button can be used for moving clips instead of copying. Clip Channel linking and group editing – linked channels are triggered by the first channel notes. Linking with CTRL also copies instrument settings except pitch. This can be used for easy chords making. When channels are linked than adjusting instrument settings with CTRL adjusts all linked channels. Steam chat integration – dblclick on AUTHOR name in song browser opens Steam chat with this user. In song mode, dblclick with CTRL sets Left loop marker and dblclick with ALT sets Right loop marker. 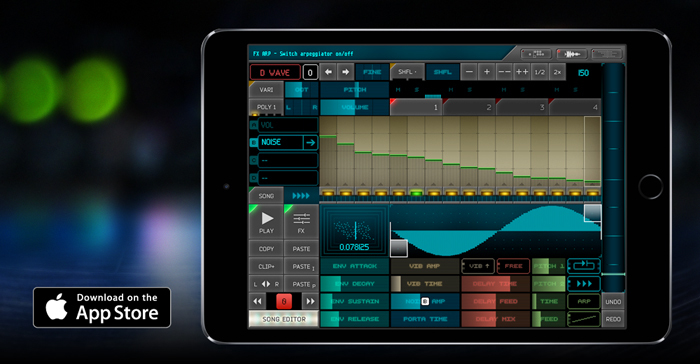 Rytmik Lite Chiptune Synthesizer v1.32 is available on Appstore NOW! Copying an instrument with a different note sequence length retains sequence length. Left and right song selectors are constrained now. Some GUI quirks were repaired. Lock is active only for songs on public cloud. Doubleclick on clip in track deleted this clip from track when MOVE was switched on. Some other minor bugs were repaired. During preview the progress bar is shown and song preview position may be adjusted. Added SEMI-LOCKED rights for song - song cannot be loaded, but its clips may be dragged from preview. Added LOOP RANGE ONLY option for EXPORT - only actual loop range is automatically exported. Added several Songs and Clip banks for Draw Synth (these uses only DrSynth and no samples). Double-tap in browser loads song and fills the browser filter. Double-tap on locked song on public cloud just fills the browser filter. 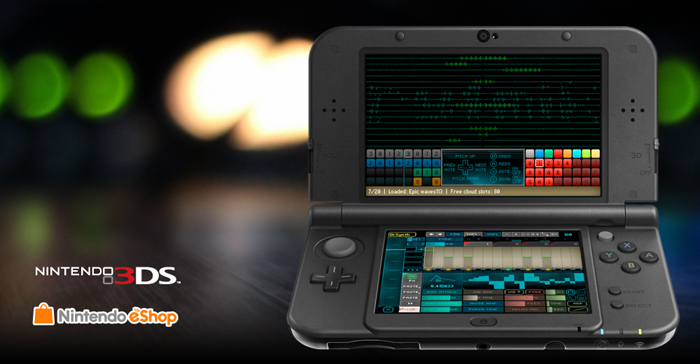 Rytmik Lite Chiptune Synthesizer v1.31 is available on Steam NOW! Rytmik Ultimate v1.31 for PC now features new GUI Skin! New keyboard shortcuts in Song Browser (Up,Down,PgUp,PgDown,Home,End,Enter). 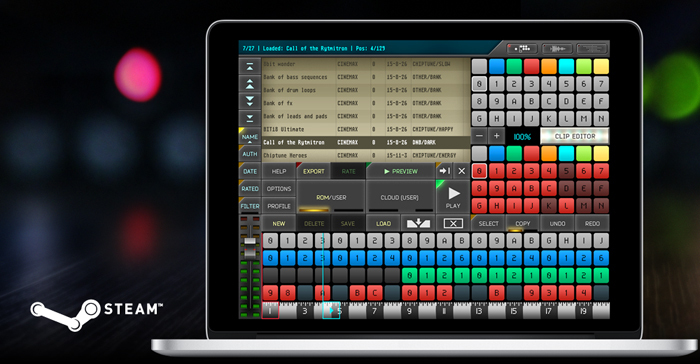 Rytmik Ultimate v1.3 for PC now features new Songs and Clip banks for Draw Synth! "Space" key shortcut for PLAY in Visualization. Doubleclick in browser loads song and fills the browser filter. Doubleclick on locked song on public cloud just fills the browser filter. Preview and Play is stopped when saving. Rytmik Ultimate v1.2 for iPad now features export to Audioshare! Submissions for Space Engineers X Rytmik contest will end on January 24, 2016. After the deadline we will pick the best entries and share them with you. Submissions for Space Engineers X Rytmik contest start on December 10, 2015 and will end on January 10, 2016. After the deadline we will pick the best entries and share them with you. Happy to announce the release of Rytmik Ultimate on December 10th, available at Nintendo eShop, AppStore and Steam! Rytmik Ultimate is Coming Soon to Steam! Rytmik Ultimate is a powerful pocket music station allowing you not only to play with samples and musical instruments but also to mix them together, shape them and create music clips or whole songs for your Friday night set-list.